In the 1950’s the Club was concerned about affordable housing for seniors and worked to build Zonta Manor, a $1.3 million passive solar apartment building on East Cambridge Ave. designed by a female engineer, one of our own members! Due to a need experienced by the Club while raising funds for Zonta Manor, the Zonta Foundation, Inc. was established – On January 25, 1957. This is the charitable arm of the club. All members of the Club are members of Zonta Foundation, Inc. 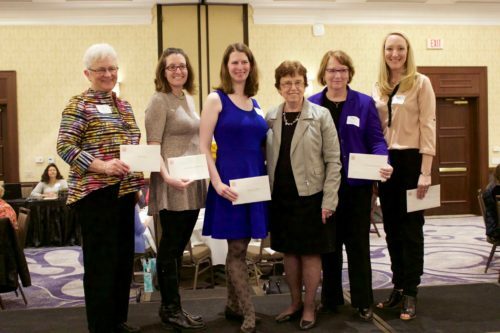 The Foundation of the Zonta Club of Milwaukee, a 501 (c) 3 non-profit, exists to raise and disburse funds. One third of funds raised are used to support Zonta International Service Projects in several parts of the world. 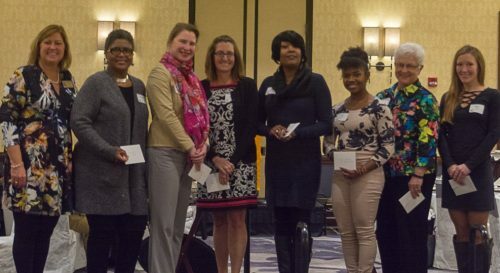 Two thirds of funds raised remain in the greater Milwaukee area and have been used to help other 501 (c) 3 non-profit agencies such as women’s shelters and transitional housing. It has also supported programs to mentor young girls and to prevent violence against women. Grants given range from $1,000—$3,000 and can be applied to programs for one to three years. Grantees are asked to provide an annual mid-year review of the program or project being funded. Thus, funding decisions are based on an agency’s non-profit status and its focus on improving the lives of women and girls, especially as it relates to violence prevention and education in the greater Milwaukee area. The Board solicits requests from agencies in the fall, reviews them and makes its decisions in mid to late January. Awards are given at the Zonta Club’s annual spring fund-raising fashion show. The Foundation is classified as a 501(c) 3 organization under the US Internal Revenue Service rules which allows donations to be tax deductible. The Foundation’s budget is kept separate from the club’s operating budget. The Foundation accepts donations and bequests and considers suggestions from members for charitable donations and financial support. It is guided in its activities by documents currently in place with regard to its mission and investment policy. Members can be assured that Board members are credible and that all monies raised will go to support that mission. Alverno College’s Girls’ Academy of Science and Mathematics empowers low income, first-generation, minority high school girls by improving their college readiness as well as their understanding and abilities in science and mathematics. The program curriculum is built around themes that are relevant and interesting to high school girls, using an inquiry-based approach. Students conduct experiments in teams and present the results of their research each semester to parents, siblings, faculty and other students. This grant will help prepare students to become college and career ready by increasing ACT scores an average of four to six points per student. CORE/El Centro off­ers healing services for all women no matter what their economic status, cultural background or religious belief, by providing natural healing therapies to integrate body, mind and spirit in a culturally sensitive environment. The Trauma & Healing Program is a collaborative venture with their on-site partner, The Healing Center, which o­ffers adult sexual abuse survivors and their loved ones opportunities for healing and wholeness by providing support and counseling, advocacy and community education. CORE/El Centro’s bodywork services and movement classes o­ffer women a chance to reconnect with their sense of self, their soul, and their sacred power. Girls in Action, Inc. is a nationally recognized charitable organization, founded in 2008 that provides leadership development programming for girls between the ages 8-12 that propels them to be catalysts for change in their communities. Girls reporting low self-esteem are more likely to report engaging in negative or harmful behaviors including, non-suicidal self- harm behaviors, and disordered eating. Human trafficking is one of the many issues addressed in the constructs of the 4 C’s Workshop: Charity, Career, Culture & Community Program, that will enable girls to develop positive self-esteem, leadership skills and confidence to be proactive with some of the problems girls face. Milwaukee Homeless Veterans Initiative’s (MHVI) Women Veterans Initiative (or WOVIN) was created in 2014 to improve services that meet the specific needs of women veterans. Women veterans experience a variety of issues that are not seen in male veterans, and there are large gaps in programs that serve women veterans. This includes health care, employment, finance, housing, social issues and the eradication of sexual assault. MHVI and WOVIN assist veterans who are homeless or at risk of becoming homeless in finding and getting set up in housing. Our New Generation’s Still I Rise Program helps Milwaukee’s youth develop academic, interpersonal, and life skills leading to self-suffi­cient, responsible and productive adulthood. Still I Rise is a program that utilizes the program leaders and community partners to purposefully engage with teenage participants in direct experiences and focused reflection. Through the Still I Rise program, girls participate in activities that will help them develop the resources and leadership they need to achieve academic success and pursue vocational, higher education and workplace opportunities. This programming addresses critical issues facing youth including peer pressure, teen pregnancy prevention, conflict resolution, crime, and substance abuse. For 40 years, The Women’s Center has provided safety, shelter, and support to adults and children affected by domestic violence, sexual assault, child abuse, and tra­fficking. The Employment & Life Skills Program promotes self-su­fficiency and addresses practical barriers to independence. Clients learn about job opportunities, careers that pay family supporting wages, the job search process, and coping skills to manage multiple roles. The program also offers job-readiness coaching, career development, job seeking assistance, mock interviews, mentoring opportunities, and transportation to career fairs and interviews. Life skills education helps women develop financial goals, create and maintain a budget, find affordable and safe housing, and understand health and wellness through nutrition education. Benedict Center for Criminal Justice, Inc.